Nearly 200 professionals from social service and health care providers, government agencies, and community groups attended the "Immigrant Aging in Queens" conference. This conference explored the multifaceted complexity of aging in immigrant communities in Queens and New York City as a whole, while offering resources and a space for networking within this fast growing field. Guests enjoyed performances from local artists, sampled food and drinks from local Queens vendors and networked with the 2014-2015 Queens Fellows and other emerging leaders throughout the borough. All of the proceeds from this event were used to support the 2015 One Queens Grant which distributed funds to projects/programs for young adults (ages 14-25) in the areas of financial literacy, job readiness, STEAM education or entrepreneurship. Friends, family members, and colleagues celebrated with 2014-2013 Fellowship Cohort and acknowledged their achievements throughout the program year. Celebrate Queens 2014 was a smashing success! It provided The Queens Fellowship, our community partners and the Queens community to come together for a night of networking, live entertainment, celebrating Queens-based artists and supporting a cause that which we all share in common - our youth. All of the proceeds from the event were used to support the 2014 One Queens Grant for youth organizations in Queens. The Queens Forum headed up a 4-series workshop to train Queens leaders' to effectively prepare their communities for disasters or emergencies. Partners included: The Center for Community Leadership at JCRC-NY, LaGuardia Community College, NYC Department of Health & Mental Hygiene, NYC Office of Emergency Management and The Salvation Army. Friends, family members, and colleagues celebrated with our first class of The Queens Fellowship and acknowledged their achievements throughout the program year. 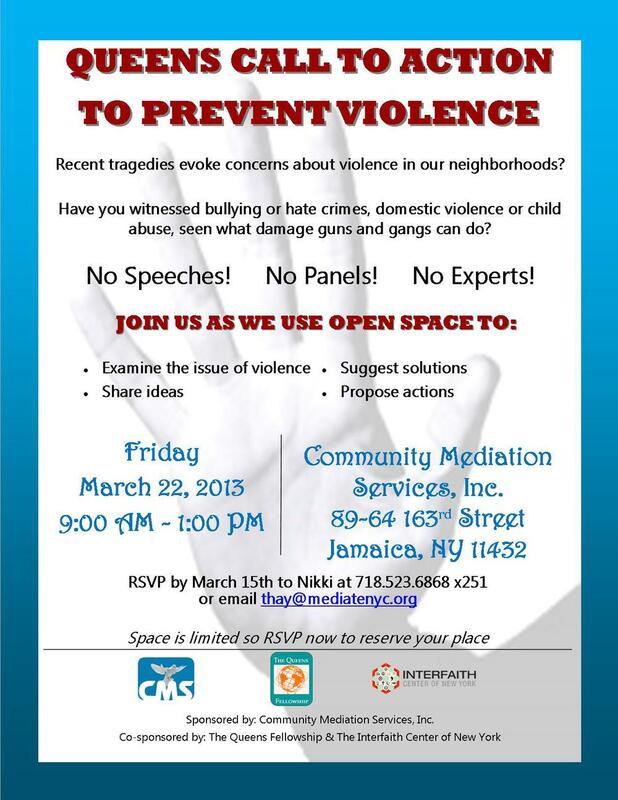 The Queens Fellowship co-sponsored this event with Community Mediation Services and Interfaith Center of New York. This event used the open space technique to facilitate thoughtful conversations amongst Queens community leaders centered on violence reduction and prevention in Queens. Over 110 Professionals from across Queens & NYC were brought together to engage in the topics of emergency preparedness and resiliency. This conference allowed a tremendous amount of information & resource sharing, the empowerment of community-based leaders and a space for networking. One Queens Friendraiser: A Night in Flushing event highlighted both the Fellowship and the One Queens Auction. The event took place at the historic Saint George’s Episcopal Church in downtown Flushing and raised over $800 through donations and items sold at the One Queens Auction. The One Queens Friendraiser showcased some of the food, cultures and artists that Queens has to offer – attendees enjoyed everything from Indian Samosas to Filipino Folk Dance performances to a Church choir. The friendraiser was also the launch of the One Queens online auction to raise funds for the One Queens Grant and raised over $1,400.